Masoala is the largest protected area in the country and is home to extraordinary biodiversity; this was recognised recently as it was made into a World Heritage site. 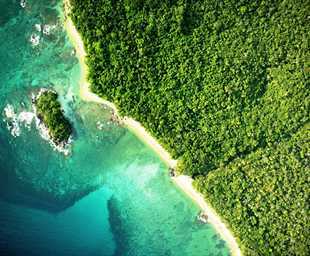 Its spectacular landscape encompasses rainforest, coastal forest, mangroves, marsh and beautiful beaches. It is the only place to see the red-ruffed lemur and can boast 9 other types of lemur along with fosa, mongoose, various chameleons, geckos and frogs. It is also a birder's paradise and, from June-September, humpback whales are often seen in the Bay of Antongil. Access to Masaola is from the town of Maroansetra, which is a 2 hour boat journey from the park. It is not the easiest area to get to with flights only a couple of times a week and the hikes do require a relatively good level of fitness. However, a visit here is extremely rewarding as Masaola can quite rightly claim to be one of the most beautiful places on the island. It is also one of the wettest, so the months of September-December are the best, with July and August also fine, but more windy. Nosy Mangabe Special Reserve in Antongil Bay is a superb day trip or overnight option, and combines beautiful coves and beaches with amazing trees and an area teeming with wildlife. An overnight stay means you have more of a chance to spot the elusive aye-aye. Swimming is also possible in the bay with turtles and dolphins often seen. Aye-Aye Island is another possible trip, however it is not always accessible. This is one of the only places in the wild where you are very likely to see the aye-aye.